We love to track design trends, and few places are better than the annual Artisan Homes Tour. It’s one thing to see a trend mentioned online or in a magazine, but the Artisan Homes Tour by Parade of Homes gives us a chance to see how they look — up close, and in person — and also see what interior finishes Minnesota and Wisconsin interior designers are using. We shared an overview of the entire tour earlier this month, but this blog will focus on window treatment trends as seen by Cora and Judy from Hirshfield’s Shop At Home. What’s new in Window Treatments? To help us appreciate their exciting new innovations and product enhancements, Hunter Douglas puts on their Premieres event each year for dealers around the country. Cindy from Maple Grove and Becky from Design Resource singled out the Silhouette® Duolite. 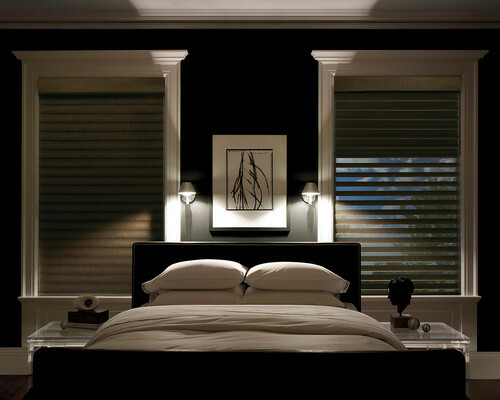 The all-in-one window shade/room-darkening roller shade looks like a Silhouette during the day, with a room-darkening shade for sleeping. The Silhouette® Duolite was actually named the 2015 Product of the Year by the Window Covering Manufacturing Association, but it was just released to showrooms for the Spring of 2016. Interior design and fashion design are continually overlapping — specially on the day Pantone announces its Color of the Year, then we all leap to attention. But we are excited to tell you about the time we recently helped two young design students steal the show at a runway fashion competition. We’ve been raving about the PowerView Motorization System ever since Hunter Douglas unveiled the system last July. And a major design magazine agrees. PowerView recently earned Interior Design’s Best of Year Award for Technology. Interior Design’s Best of Year ceremony was held at legendary architect Frank Gehry’s IAC Building in New York, where 975 designers, architects, and manufacturers gathered to learn the winners across 43 project categories, 61 product categories, and 11 materials. It’s awards season. The Golden Globes got us started, with the Oscars and Grammys on the way. But no matter how much somebody or some group cleans up at any of those events, it will be hard to match the showing Hunter Douglas made at the 2015 WCMA Product Awards. Hunter Douglas won an amazing 31 awards at the annual Window Covering Manufacturers Association event, held this past November. All product award winners were recognized this past week in Las Vegas, at the International Window Coverings Expo. Hunter Douglas has received the WCMA Product of the Year award for the 15th time. The WCMA Product of the Year, awarded annually to the product that stands out across all categories and judging criteria, is Silhouette® Duolite™ Shadings, designed and engineered by the Silhouette® Product Development Team at Hunter Douglas. A special project completed during National Window Covering Safety Month will have a lasting impact for children in Anoka. The stock vinyl mini-blinds at the Little Blessings of Anoka Early Childhood Learning Center were a safety hazard, so the non-profit, Awareness of Blind Cord Safety (ABC’s), organized a project to fix it. Hunter Douglas, Hirshfield’s, and Blind Installation & Repair worked together to bring the safe, new window treatments to the learning center. Hunter Douglas contributed Applause® honeycomb shades with a LiteRise® operating system for every classroom, while Blind Installation & Repair took down the old blinds and handled the reinstallation. The final installation of the shades was celebrated at a grand re-opening event during National Window Covering Safety Month in October. Window covering safety packages were also distributed to all of the families at the unveiling event. The Hunter Douglas product line features the widest selection of child safety products that eliminate lift cords or substantially reduce access to them. The Window Covering Safety Council sponsors National Window Covering Safety Month every October to increase awareness of the potential dangers associated with corded window coverings. Keep all window cords well out of the reach of children. Install only cordless window coverings in homes with young children. Make sure tasseled pull cords are as short as possible. Continuous-loop pull cords on draperies and vertical blinds should be pulled tight and anchored to the floor or wall. Be sure cord stops are properly installed and adjusted to limit inner-cord movement. The Window Covering Safety Council offers free retrofit kits if you prefer to keep your older window treatments. Hunter Douglas has plenty of great cordless options, including PowerView Motorization System and Pebble Remote Control. Since Frank and Elizabeth Hirshfield opened their first store in 1894, it has been our mission to do the best job possible meeting customer needs and solving customer problems. Hirshfield’s. People and products you can trust. Shopping for window treatments can be a lot of fun. The right styles, fabrics and colors can really bring a room to life. And the most energy-efficient models can even save you a lot of money — if you know what to look for. But what if you don’t? That’s where a new online offering from Hunter Douglas steps in.